He is of Belgian and Polish ancestry. He was raised on a farm near Taunton, Minnesota. Hegarty, Sue. "Welding the Economy Back Together." 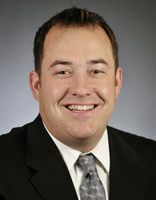 Session Weekly, St. Paul: Minnesota House of Representatives Information Office, January 14, 2011, p. 14.